PCECD Castlevania: Rondo of Blood (JPN) "Maria mode" in 24:23.47 by adelikat, arukAdo & paul_t. 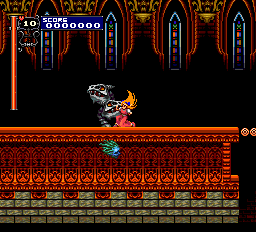 After having been resurrected by dark priest Shaft, Dracula set out to destroy Richter Belmont's home village and kidnap some of the important characters for him to rescue. One of them is Maria Renard, a 12-year-old vampire huntress who is used as the player character in the second half of the movie after getting freed by Richter. Despite her prepubescent age, Maria is faster and stronger than Richter, and one can only guess how she managed to fall a victim to kidnappers in the first place. Unfortunately, all of her speed advantages become nullified by a lengthy cutscene following her release, making this TAS slightly longer than the Richter mode. Note: As of 12 Aug 2009 the torrent has been replaced to fix the framerate and aspect ratio. Please redownload if you've acquired the file prior to that date.